An old sage in a new age! As a quadragenarian (aka a member of the 40-49 age bracket), there are few things that can shock or genuinely surprise me. I must admit that the Internet has done a fantastic job of adding things to that list over the years. However sometimes I get a pleasant and unexpected surprise that I feel compelled to share with you. ScottyPedia often likes to lose himself in music! If you are a child of the 80s like myself, you will no doubt recall that the introduction of the Nintendo Entertainment System (NES) in 1985 forever changed the gaming industry. As the first console that had legitimate worldwide mass appeal, the NES revolutionised an industry that had pretty much become stagnant by the mid-80s, producing graphics that were cutting edge and eye-catching at the time. Perhaps the most popular and enduring character in the Nintendo landscape is Mario, as introduced to us through the Super Mario Bros. game that came with each console. 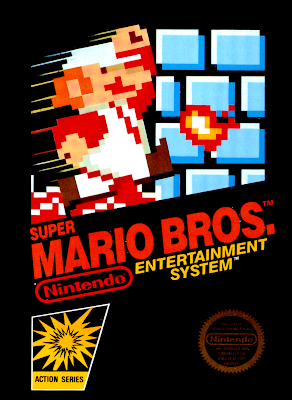 I am certain that many of you know the iconic Super Mario Bros theme and can recognise it from hearing just a few of the opening notes. Back then, the music was made up of MIDI sequences created by the legendary and prolific Nintendo game composer Koji Kondo. The original artwork for the 1985 release of Super Mario Bros.
Where is the surprise though? Well, whilst on Facebook recently I received a "suggestion" to view a video that catalogued the musical evolution of the Super Mario theme through the years as the Nintendo consoles and Super Mario titles changed. Not really being a gamer, I was unfamiliar about these developments. At one point in the video I heard something that made me stop and replay that segment of the video several times over - an a capella version of the theme. 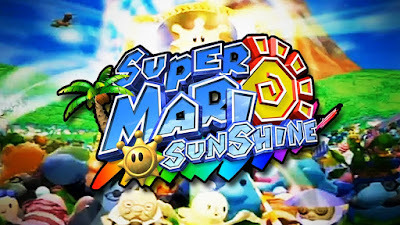 Apparently it came from the game Super Mario Sunshine (2002) for the Nintendo GameCube - a game I hitherto knew almost nothing about before a few weeks ago. Super Mario Sunshine was released in 2002 as the first Mario-based title for the Nintendo GameCube. Nerd that I am, I initiated a hunt via the Internet to find this theme so I could listen to it in full. It took some doing because apparently this a capella theme only plays during a secret course within the game. My search led me to Smash Custom Music and I finally go to listen to it. Hooray for me! Hooray for you too if you want to listen to it as well, click here. Mission accomplished? Not quite yet, there was another surprise in store. When I perused the list of available themes, I saw that several of them had a Yoshi version - one that played in the game if you entered the stage with Mario riding Yoshi (an anthropomorphic dinosaur). Curiosity got the better of me and I decided to sample one of the Yoshi versions after listening to the plain version. 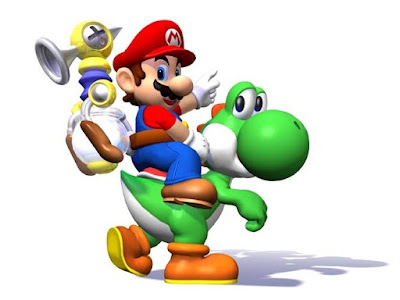 Well, I was blown away because: all the Yoshi versions of the songs feature one additional instrument - the tabla. There are some that might argue that it may be bongos (which admittedly does produce a similar drum sound) but I'm sticking with the tabla! Naturally this gives a very East Indian variation of the original melodies. You can listen to a medley of the plain and Yoshi versions of the Secret Course theme here (my advice would be to forward it to around 1:20 so you can hear the lead-in to the tabla transition, it is unexpected and awesome!). 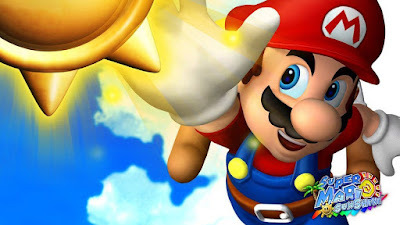 Mario is always leaping to and for stars! After hearing that, I naturally began to wonder about Trinidad and Tobago's national instrument - the steel pan. 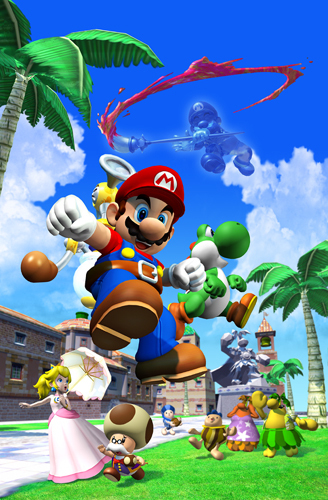 Over the years, Kondo has used pan music to affect a Caribbean feel to the scores in the Super Mario games and this game's setting is the fictional tropical Isle Delfino. So another surprise was in store when I encountered the Gelato Beach theme that featured steel pan as the lead instrument! You can listen to it here. I have one more surprise for you though ... there is also a Yoshi version of Gelato Beach! 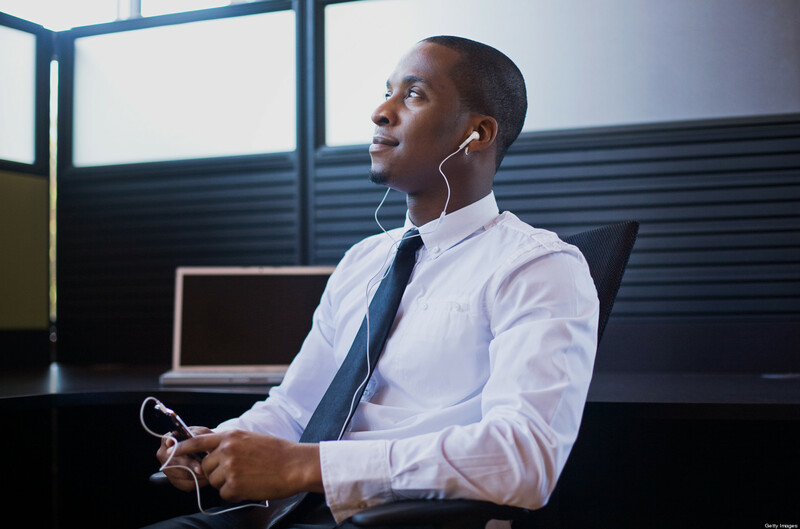 You can listen to that fusion of East Indian and West Indian vibrations right here. 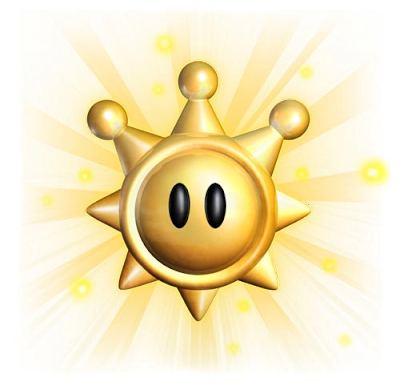 The Shine Sprite from Super Mario Sunshine. If you appreciate music and are interested, I would urge you to check out the site for yourself and listen to the theme songs there. 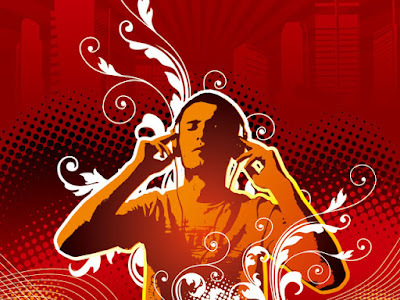 In addition to the original in-game themes, there are also user-submitted mixes and remixes that cover a wide range of instrumentation and variations on some of the themes as well. One of my favourites is the Delfino Plaza theme. This is the original version here. Two of the remixes I'm partial to are the Brentalfloss Remix and the Nintega Dario Remix, both of which feature the steel pan (an instrument that is absent in the original version). And, if you like mellowed-out interpretations, this re-arrangment by Megalorganiste should tickle your fancy (as a piano fan, I especially like that piano drives this melody). Feeling to hear the full four-minute Megalorganiste version? Then click here! 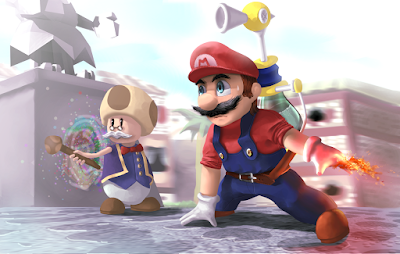 Mario, Yoshi and the whole gang on Isle Delfino! Feel free to let me know your thoughts about these musical gems and on video game music in general. Personally, I find that many small treasures of content such as these exist and happen to pass under our radar too easily. Hopefully I can help bring some of them out! Has the following ever happened to you - you listened to a song in your youth and misheard the lyrics, kept those misheard lyrics in your head for decades, then had a revelation about the real lyrics that had nothing to do with your long-held notions about the song? That happened to me quite recently. For some reason a song from the mid-80s popped up in my head out of the blue. Not having heard the song for at least 25 years, my thinking was that the song was about a man pleading with his girlfriend that the reality he is working hard to make for them both can in be what she desires. Although for the life of me I could barely remember the verse of the song in question, my version of the chorus went like this: Tell me why ... Can't this be your dream? I could have died, baby! 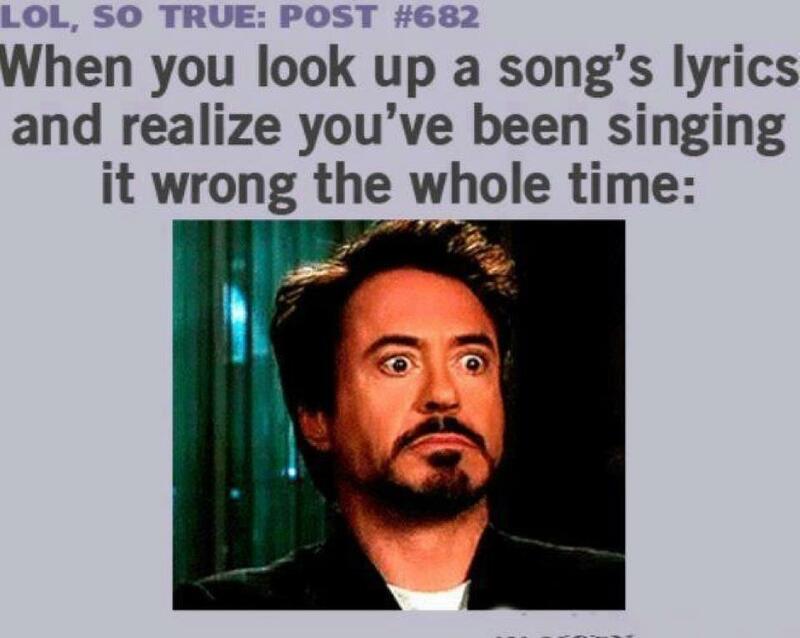 That is the lyric! Of this I am 100% certain! With this swilling about in my head for three decades, I finally decided to chase down the song on the Internet last week. It turns out the the song is called Digging Your Scene and was a 1986 hit for a British pop band called The Blow Monkeys. (You can view the music video on YouTube.) However, listening to the song again brought an entirely new meaning for me when I heard the true lyrics (which you can look at in full here). ScottyPedia had this moment very recently! Far from being a melodramatic plea made to a finicky lover, this song was actually about AIDS and homosexuality in the early-to-mid 80s! To the best of my knowledge, the only pop song that openly dealt with a homosexual topic that I remember hearing on the radio back then was Rod Stewart's The Killing of Georgie Pts. 1 & 2! Which is probably why I don't remember hearing it on the rotations of our (then) notoriously conservative local radio stations. Although the song has a very up-tempo and catchy beat, with the obligatory saxophone solo that was a staple of 80s soft rock, the subject matter sung about was very heavy indeed. In short, the song is about a closeted gay man who learns that his lover/friend is dying from complications from AIDS and the man in personal anguish as he faces (what he personally feels is) an accelerated mortality. Considering that the popular and memorable songs of 1986 were offerings like Mr. Mister's Broken Wings; Lionel Richie's sultry Say You, Say Me; our own Billy Ocean's There'll Be Sad Songs (To Make You Cry); Peter Gabriel's sexually charged Sledgehammer, Falco's legendary Rock Me Amadeus and even comedian Eddie Murphy's surprise smash hit Party All The Time; this song dealt with a rather morbid and controversial topic. Ah, the mid-80s! 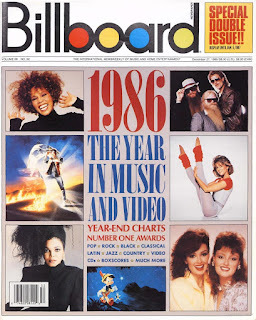 Times of Whitney Houston, Janet Jackson, Madonna and Cyndi Lauper! 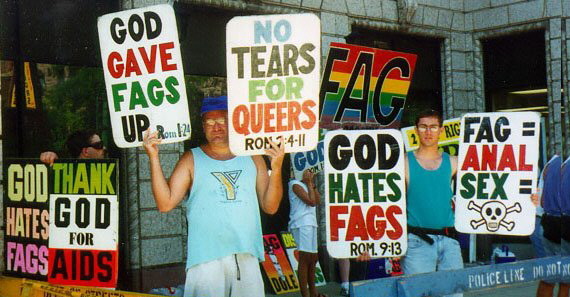 The early 80s were a troubling time for the homosexual community worldwide. 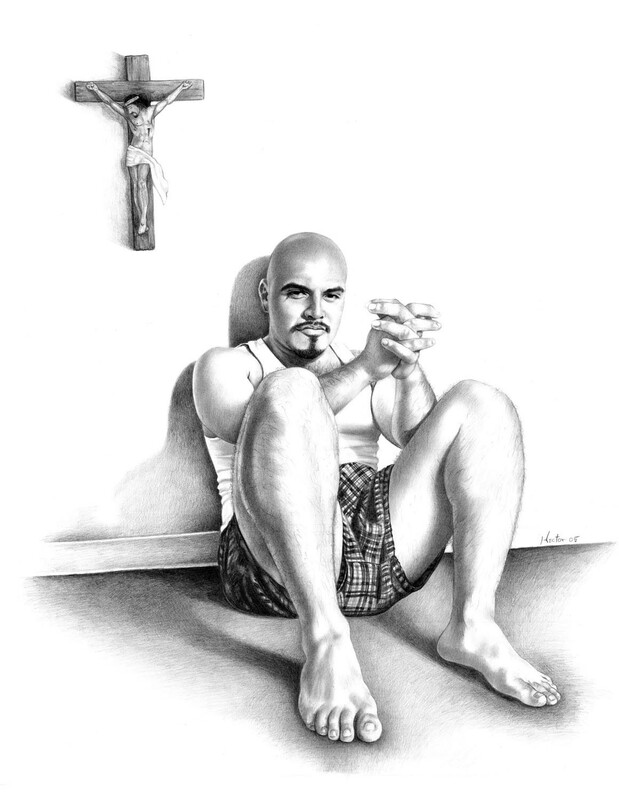 They suffered persecution for their sexual preferences that extended into all aspects of society. This included the mainstream media as well where open mention of your non-heterosexual leanings was considered a kiss-of-death to your career and prospects. I'm sure many of you who lived in the era will remember that it was usually after certain male celebrities died that we realised the herculean efforts made to maintain a macho, heterosexual public image that belied their private preferences. The names of Rock Hudson, Cary Grant, Raymond Burr, Liberace and Freddie Mercury easily come to mind. As many closeted gay men chose to mask their preference by entering into conventional (but unsatisfying) marriages, they would look to secretly frequent the gay clubs to express their true selves. This club scene that admittedly attracted gays and heterosexuals alike, as it was referred to in the song, is what the song's protagonist is 'digging'. 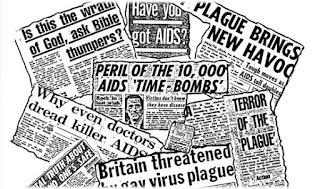 In the devastating early years of the AIDS crisis, it was publicly characterised as a gay people's disease. 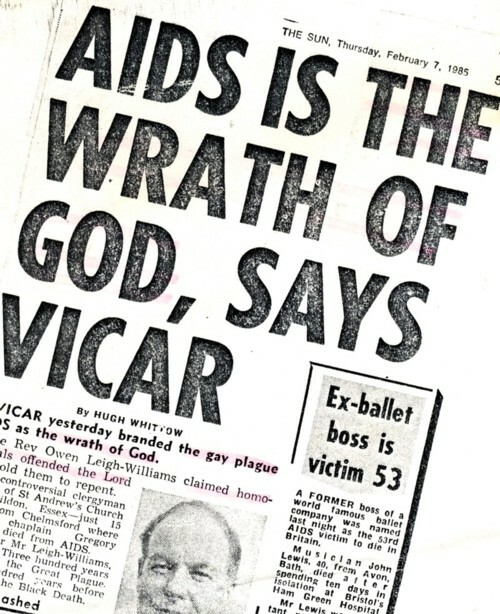 In fact, the song alludes to this as many homophobes called HIV/AIDS "God's revenge" - a virus that was cutting down the men from the gay clubs. 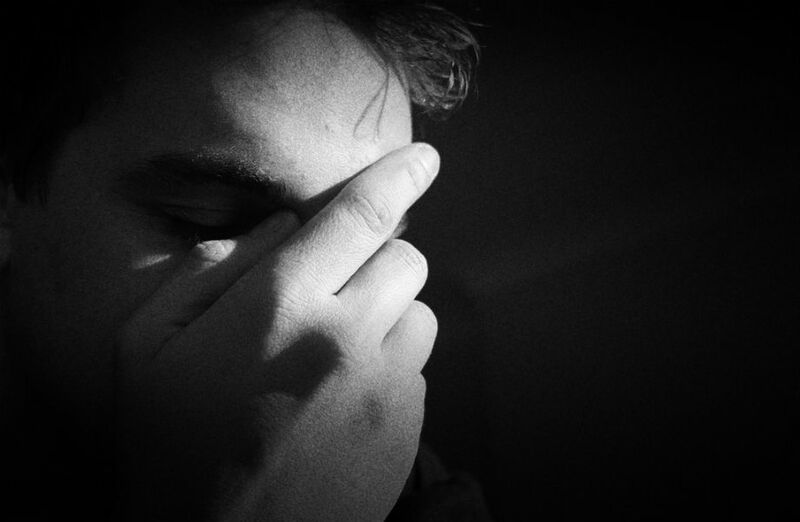 Although it is a sexually transmitted disease (meaning a person of either gender can contract it), the homophobes often blamed closeted gays for spreading it into the heterosexual community. A sampling of the kind of AIDS-related headlines of the era.! Part of this conflict also has to deal with how society at the time misunderstood homosexuality and misinterpreted the root of the preference, treating it like it was a disease or depraved mental condition that the sufferer needed to recover from. 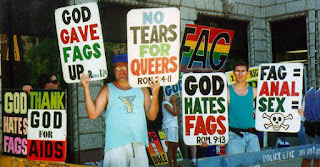 For the already conflicted closet gays, this was doubly hard as they tried to maintain a 'normal' heterosexual façade. For several of them, their straight peers would espouse the opinion that being gay was 'not normal' (note not different, mind you). So society pressured many conflicted individuals into some serious self-loathing, thinking that their problems would all go away if they embraced their false heterosexual identity, as the song says, I'd like to think that I was just myself again. Sadly, this was the thinking of many in the era! Perhaps the most haunting part of the song is the chorus. In it, the protagonist laments that, despite knowing the high pprobability of fatal consequences in continuing his actions, he is inexorably drawn into the gay life. Indeed, he wants to know ... why is it I'm digging your scene?/I know I'll die, baby! 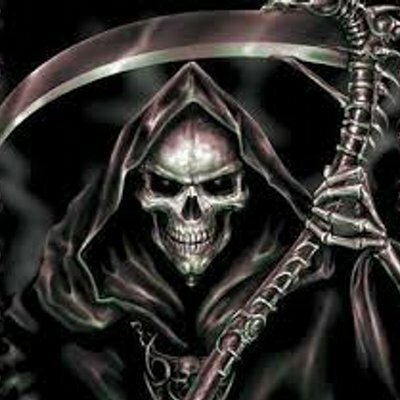 ... while Death stalks you! For me, the music video does very little to convey the song's meaning. My suspicion is that back in 1986 a video around such themes would be a commercial disaster for all involved, despite what the words of the song openly expressed. 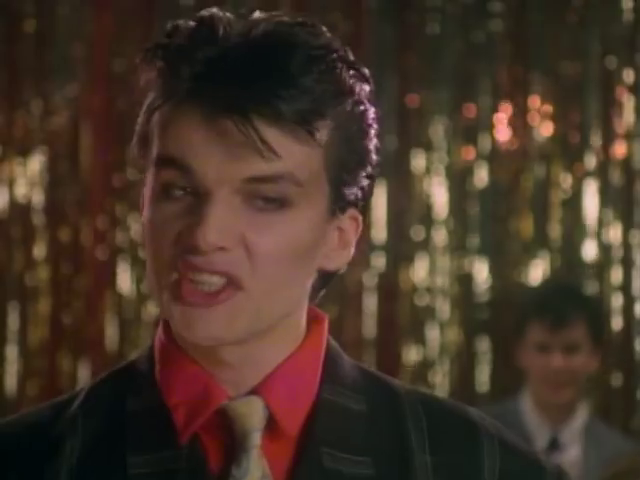 What we end up being treated to is the lead singer - Dr Robert - at his androgynous 80s best camping it up for the camera as a nightclub singer, not really doing anything in regard to the song's very serious topic. By strange coincidence, the most popular song of 1986 happens to be That's What Friends Are For, sung by Dionne Warwick, Gladys Knight, Elton John and Stevie Wonder (officially listed as Dionne Warwick and Friends). This song was recorded as a charity single to benefit the American Foundation For AIDS Research, and asks for compassion and understanding in dealing with persons who were suffering with the disease. There is a bit of irony here in that Elton John, who is openly gay now, was at the time in a existential dilemma not unlike the Digging Your Scene's protagonist. For decades John had tried to project a heterosexual image during his early professional career despite several rumours to the contrary, culminating in a sham marriage in 1984. After the inevitable divorce four years later, he official came out as a gay man and has remained proudly so since. Note the use of scripture to "justify" the anti-gay stance. And this is very recent! 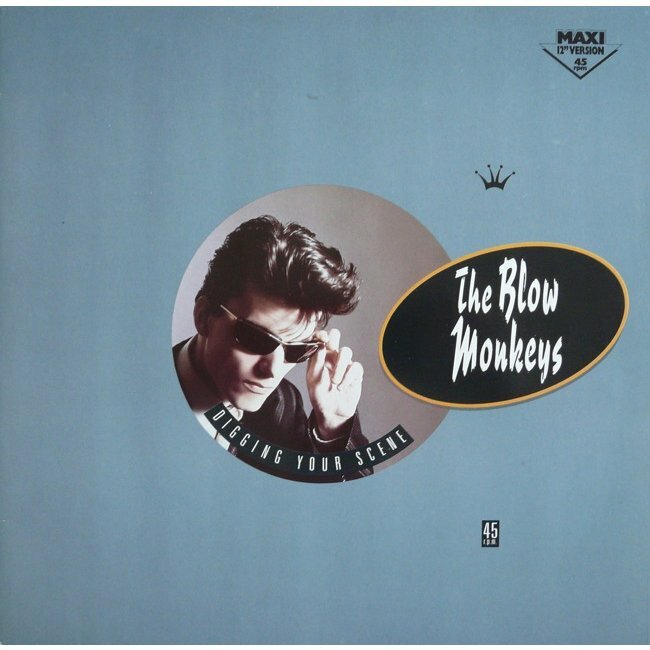 It is now a full 30 years since Digging Your Scene was released. Although the messages contained in it are not as relevant today as attitudes to the LGBT community have changed considerably, it does remain a poignant reminder of a time when society was nowhere near as liberal-minded and accommodating. And I still find myself singing the chorus even though it bears no personal relevance to me. I am grateful for the knowledge gained through this lyrical journey though. It makes me wonder what other songs there are out there that dealt with similarly controversial topics. Believe me, it's even harder than this sometimes! 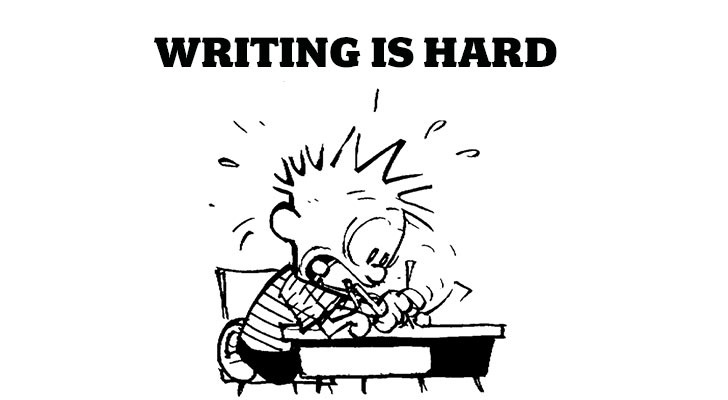 Writing a blog can be a hard task, even for someone to whom words come fairly easily. 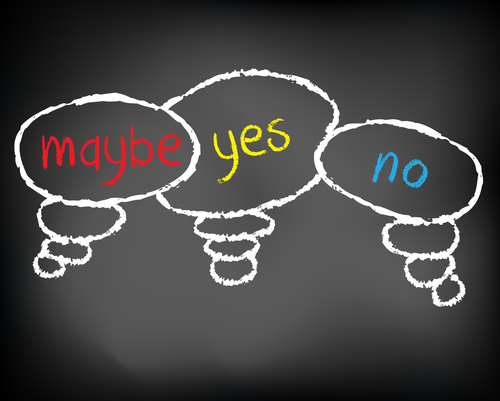 Topics of interest don't always come by when needed and it is hard, if your wish is to have meaningful posts of good length and adequate substance. Then, sometimes, people like Dr. Roodal Moonilal, the UNC MP for Oropouche East, come along and make my job very easy indeed. In my last blog post, I spoke about the language use (and abuse) by Moonilal's political leader, Kamla Persad-Bissessar. If it can be considered a compliment by comparison, at least I would consider her utterances as scalpel-like in delivery. 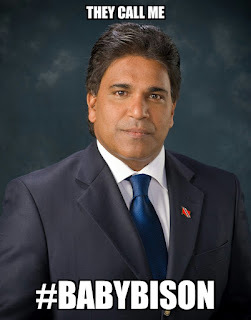 However, our goodly Dr Moonilal aka #BabyBison (due to his portly dimensions) is always a man known to swing a cutlass where a razor blade would suffice. 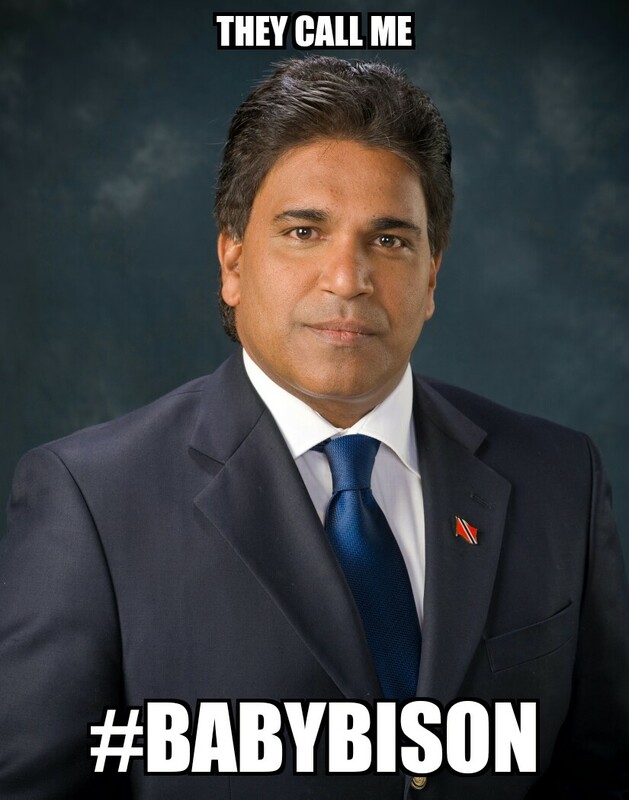 During the contribution of Attorney General and MP for San Fernando West Faris Al-Rawi during the Budget debate, #BabyBison was engaged in some annoying crosstalk, which the microphones were picking up quite clearly. Very loudly came the following outburst from Moonilal, "Hush your stink mouth!" 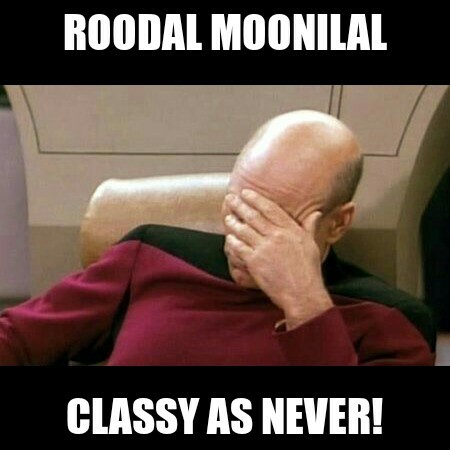 Always a paragon of virtue and class, this Moonilal. 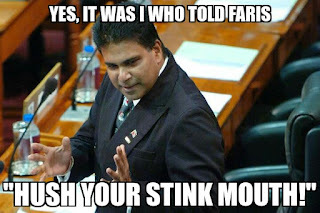 The remark caught Al-Rawi's attention and without missing a beat he immediately responded with shock and open disapproval of Moonilal's behaviour. The situation was severe enough to cause the Speaker of The House Bridgid Annisette-George to rise to her feet to issue an open reprimand to all MPs who were engaging in cross talk on both sides. I have a video link of the exchange that you can take in for yourselves. To Al-Rawi's credit, he never lost his poise during the incident and continued with his contribution. The outburst can be heard three seconds into the clip. 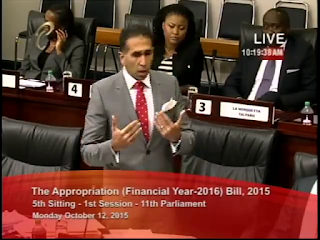 Faris Al-Rawi looks in Moonilal's direction immediately after the comment. Later in the day, in an apology as rich in contrition as the Caribbean Sea is rich in penguins, Moonilal said he was sorry for the comments he may have made during cross-talk in the House. Note he wasn't sorry that his comments may have been offensive (which they were) to viewers, listeners and/or his intended target (which may not have been Al-Rawi); he seemed to suggest that there could be some doubt as to the comments existence as well. And, cheekily too, he seemed to also imply that comments made in cross talk could be as rude and disgusting as possible, since the person uttering same was not making an official contribution at the time. Wow! That apology requires its own apology! Again, this goes to show the mindset of some people for whom, you'd think, because of their education and status in society, should be exemplars in thought, word and deed. Instead, we get these classless displays that again show that the people's business - the stuff they were elected to carry out on our behalf - becomes secondary as pettiness and immaturity reign. Some might think I'm expecting way too much from persons whose track records in this area are overwhelmingly negative but that will not deter me in demanding better from them. And you should too! 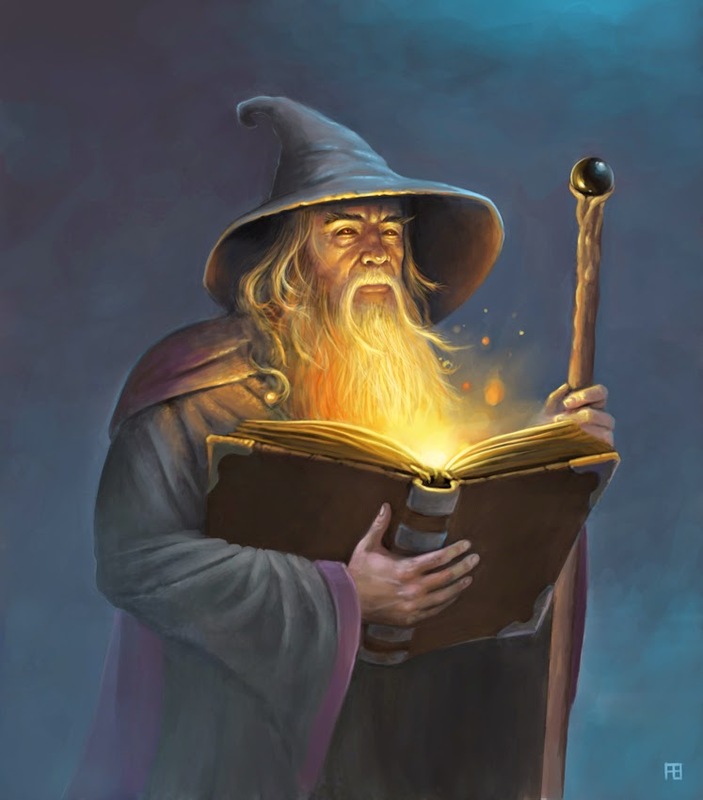 ScottyPedia consulting his tomes of knowledge!